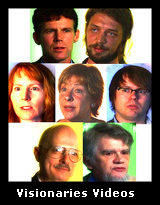 The free films and podcasts found on this segment of the Imagining the Internet site include interviews conducted in 2005 with forward-thinking people who had gathered at the Accelerating Change Conference at Stanford University. Listen, view and download files in which Douglas Engelbart, Vernor Vinge, George Gilder and others hold forth. These interviews are protected under a restricted Creative Commons Noncommercial license. Vernor Vinge- Mathematician, computer scientist and author of "True Names" and "The Coming Technological Singularity." In 1982, at a panel for AAAI-82, Vernor Vinge proposed that in the near future technology would accelerate the evolution of intelligence, leading to a "singularity." In the 1980s and 1990s, he elaborated on this theme in his writing. He taught at San Diego State University from 1972-2000. He is the author of two Hugo Award winners. George Gilder- Gilder is the editor in chief of the Gilder Technology Report and the author of The Silicon Eye. He is a senior fellow at the Discovery Institute. He is a founder of and contributor to Forbes ASAP and a contributing editor of Forbes magazine. He is the author of a number of important books, including "Life After Television," "Telecosm" and "The Silicon Eye." Alex Lightman- Lightman is co-founder and CEO of Charmed Technology, a developer of wearable wireless technology. He was CEO of the IPv6 Summit in 2005. He is a leading writer and speaker on the future of technology, writing the book "Brave New Unwired World" and publishing more than 100 articles between 2000 and 2006 for business, technology and political magazines. He has been a marketing manager for Reuters and Intellicorp. Patrick Lincoln- Lincoln is Director of the Computer Science Laboratory at SRI International in Menlo Park, CA. He has a Ph.D. in Computer Science from Stanford University. He has worked at the Los Alamos National Laboratory and MCC Software Technology. One of his recent research pieces is "Towards a Semantic Framework for Secure Agents." Thomas Malone- Malone is a leading professor at the MIT Sloan School of Management. He is also the founder and director of the MIT Center for Coordination Science and was one of the two founding co-directors of the MIT Initiative on "Inventing the Organizations of the 21st Century." He teaches classes on leadership and information technology and his research focuses on the influence of information technology on business. His 2004 book "The Future of Work" is a classic in the field. David Smith- Smith is the principal architect at the Croquet Project, where he works with Alan Kay and other technology visionaries. Smith has been focused on interactive 3D and using 3D as a basis for new user environments and entertainment for nearly 20 years. He designed The Colony, the first 3D interactive game, and he cofounded Red Storm Entertainment with Tom Clancy. He previously worked at Thermo Electron Corporation, Softrobotics and the Thomas Lord Research Center. John Smart- Smart is the founder and president of Acceleration Studies Foundation, a nonprofit community for research, education, consulting and select advocacy, and the co-producer of Accelerating Change Conferences. He is a developmental systems theorist who studies accelerating change, computational autonomy and the technological singularity. Sri Sridharan- Sridharan began working with computers in India in the 1960s. He worked, was educated and/or taught in a number of disciplines at Stanford, Technische Universitat (Munich) and Rutgers before founding the Pitman/Morgan-Kaufmann series of monographs on AI. He has worked in leadership positions at BBN Labs, FMC and Intel, where he was chief architect for Knowledge Management until 2000. He is now semi-retired, and has founded TrustNet to advance human trust. Tom Munnecke- Munnecke spent 30 years designing large-scale hospital-information systems for the VA and Department of Defense, then quit his job as a VP and chief scientist for a Fortune 500 company and founded GivingSpace, a think tank that explores uses for technology in humanitarian activities. He founded the Uplift Academy, which seeks to use global networks to discover what's working to make the world a better place and how to do more of it. Frode Hegland- Hegland was born in Norway and currently works in London at University College on research project called “Liquid Information” which allows all users to make connections, change the way information is presented and relate it to other information on the web. It allows a user to make each word in an online document a potential hyperlink and allow users to process data in any conceivable manner. Allen Taylor- Taylor is editor of the Institute of Electrical and Electronics Engineers BEEEP. He has been president of the Oregon chapter of the National Space Society. He designs attack-resistant networks. He has written 20 books, including "Database Development for Dummies." He teaches an e-course on database development through a network of more than 1,000 community colleges and adult-education institutions. Melanie Swan- Swan, president of Cygnet Capital, is a professional options trader and portfolio manager based in Silicon Valley. She has concentrated her career in investment management, strategic technology development, finance and entrepreneurship. She formerly served as research director of telecom economics for RHK Inc., a communications industry consultancy. Bruno Haid- Haid is a co-founder and the head of strategy at System One, a company merging social software, the sematic web and artificial intelligence. Earlier in his career, he worked at spielplatz.cc, now part of the Global Tribal DDB network, one of the top mobile marketing agencies in Europe. Robin Raskin- Raskin is the former editor in chief of FamilyPC, editor of PC Magazine and columnist for USA Today Online and the Gannett News Service. She has written six books about parenting in the digital age, and she advocates parental involvement in raising digital kids. She frequently addresses parents and educators, policy makers and leaders in the high-tech industry on topics like internet safety and raising digital kids. Stephen Aguilar-Millan- Aguilar-Millan is the director of research at the European Futures Observatory, and his expertise is in societal futures as they are influenced by technology. He is currently working on a project examining the social boundaries to technological development. Niti Bhan- Bhan is a strategic design consultant who writes for the Perspective blog and contributes to the global innovation forum CPH127. She is working on a paper combining the characteristics of liminal space and its value as the engine or root cause of innovation. She is an engineer based in the Silicon Valley. David Swedlow- Swedlow is a software quality assurance engineer from Austin, Texas. He is working on a social-software consulting project. He is a co-founder of Synergy for Practical Conceptual Innovation. He is co-writing a book on Situation Mapping. He was a presenter at the 2005 International Conference of the American Creativity Association. Jim Turner- Jim Turner is an administrator with the Acceleration Studies Foundation. He says that in the short term the capacity for human organization and communication is where we are going to see the acceleration in technological growth specifically in terms of the adaptations of those technologies. Justin Lee- Lee is from Singapore, and is participating NUS Overseas College Program at the Stanford Center for Professional Development, focusing on learning how companies are started and how universities commercialize technology and bring that information into the marketplace. He has experience in information systems and expects to work in the software industry. Samuel Coniglio- Coniglio is a writer and photographer. He's a former NASA employee, and he worked at the Kennedy Space Center as a technical writer. He is writing a book on space tourism, he is founder of the Space Tourism Society and works to promote the private space industry. Harold Linstone- Linstone is the editor and chief of the international journal Technological Forecasting and Social Change and a professor emeritus of the Systems Science Ph.D. Program at Portland State University. His particular field of interest is in the likelihood of the continuation of the Kondratleff long-wave cycle in the 21st century. Douglas Engelbart- Engelbart is a winner of the National Medal of Technology and an inspiration for most if not all of today's technology innovators. Among many achievements, he demonstrated the first computer mouse and the first use of a cathode-ray tube to display computer text and graphics, but his biggest contributions, through his Bootstrap Institute and associated efforts, come in his effort to inspire society to use innovation to tackle complex problems in ethical ways. The videos and podcasts on this site are offered for use under a Creative Commons Noncommercial License allowing no derivative works.